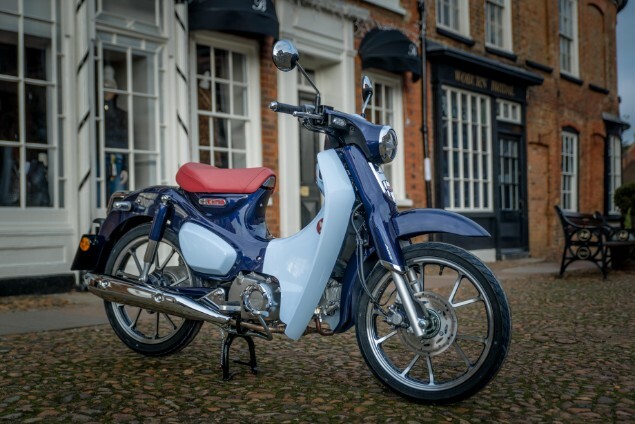 Nostalgia can be a disarming emotion that blinds you to the actual reality of what things were like back in time, but in the case of the all-new Honda Super Cub C125 it’s good news. Not only can you look back with fuzzy nostalgia on the old bike but you can ride and own the new one knowing it’s massively improved, decent fun to ride, yet still offers frugal and easy-to-ride commuting just like the original. The leading link forks of the original which gave the slightly odd ‘lifting’ sensation under braking have been replaced by traditional forks and they are hugely improved, soaking up big and small bumps well. The 17in wheels offer an advantage over many scooters which usually have smaller wheels and end up being adversely affected by bumps translating into steering instability. The front brake needs a bit of a tug on the lever but that lever now operates a 220mm single disc which, in combination with the rear drum brake is effective and is backed up with the safety of ABS for the first time. As more miles were added to the almost box-fresh Super Cub test bike, the front brake pads and disc were bedding in and braking was improving. In almost every single conceivable way, the new bike is substantially better than the old, but that really shouldn’t come as a massive surprise when you consider the age of the origins of the old bike. 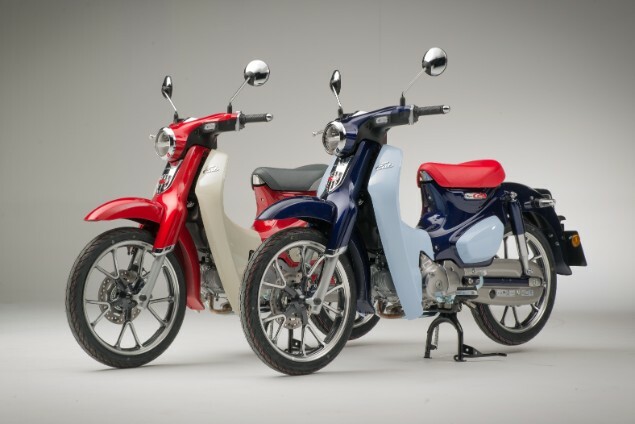 However, it would have been easy for Honda to lose the essence of what has always made the Super Cub so disarmingly attractive to so many people; thankfully they haven’t! Honda presented the new bike around a year ago as a concept but that show bike was so well resolved it was impossible to dismiss the thought it would soon be available. The bikes are now starting to appear in UK Honda dealerships with an on the road price of £3399. Finance deals on a three-year PCP will see one of the new Super Cubs in your garage for £65 a month with a £323 deposit. Honda first built a Super Cub 100 way back in 1958 as a 50cc four-stroke at a time when the Honda company was only 10 years old and the market was dominated by two-stroke rivals. It’s the bike that formed the foundation of the entire future of Honda and more than 100 million have been sold around the world. In recent years, the Super Cub C110 has only been available officially in Japan and South East Asia with the engine unable to meet stringent European emissions regulations. 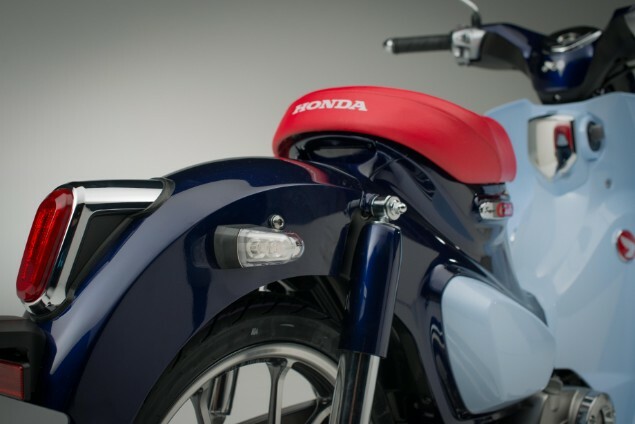 This is a subtle reworking of the shape that has sold more than any other powered two-wheeler anywhere else on the planet; the silhouette will be familiar to anyone who has ever seen a Super Cub. The layout of the bike is pretty much the same as the old bikes; but everywhere you look you can see those modern technical changes replacing the old version. The front lights and indicators are LED, the dashboard’s central display is LCD, there’s keyless ignition with an immobiliser and an alarm system too. The automatic centrifugal clutch works with the four-speed gearbox in pretty much the same way as the old bike but has been refined to make gearchanges smoother and quieter. The pivoting gearlever still works the same way with your left toes moving the lever down to change up and your left heel pressing down to change down a gear, all without a clutch lever. Honda has kept to the mantra of the original bike with a simple, robust, reliable and economical single-cylinder, four-stroke engine. 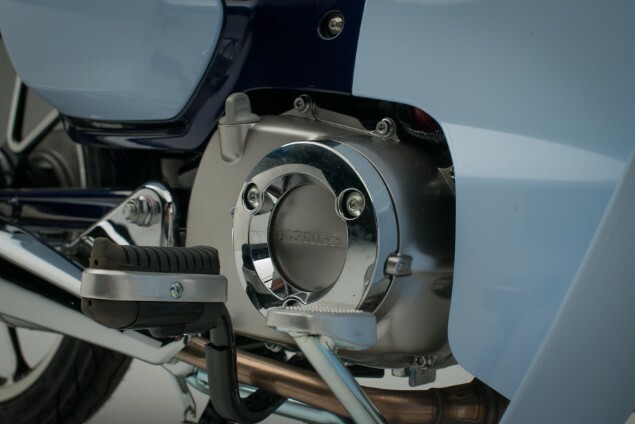 However, the latest motor may still be an air-cooled, SOHC 125cc unit but it gets fuel injection to ensure it remains clean in relation to emissions. Peak power is now 9.5hp at 7500rpm with 10.4Nm of maximum torque is never going to make the new Super Cub a performance machine but that’s not what the Cub has ever been about. What it will do, with the correct maintenance and servicing, is keep running for many years while remaining economical, quiet and reliable. With an official economy figure of 188.4mpg tested under the WMTC testing regime, this equates to more than 150 miles from just 3.7 litres of petrol. Real life experience, especially if you end up tackling some higher speed roads and the engine works harder, this will drop a fair amount but your are still going to be looking at 120mpg on a bad day. Let’s be honest, pretty much any mainstream 125cc twist and go scooter is actually more practical than the new Super Cub C125 but that’s really not the point. Honda has the PCX125 scooter which is Europe’s best-selling two wheeler and with good reason; it’s an absolutely excellent scooter that does the job of transportation but doesn’t generate much excitement or affection. The Super Cub is very different. It’s got the rational side of being an economical, reliable and comfortable commuter bike but it also has an awful lot of charm and the improvements made by Honda have made it a much improved motorcycle. Children love it, motorcyclists will almost certainly have some fond memories of riding one at some point in their lives, and it has a charming, warming and lovable nature that is so often missing from scooters which are superb at being a useful appliance. 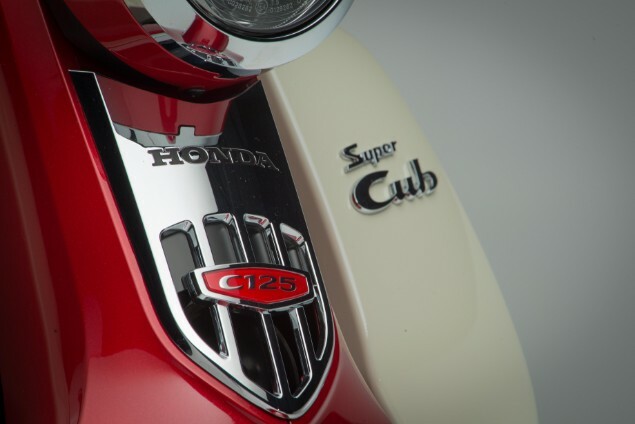 The best bit about the Super Cub C125 is that it exists. Honda has made the effort to re-engineer a legend of motorcycling and we can all make the choice to buy one again; and that’s a very good thing.